the French hydrologist Vincent introduced the conductivity and it’s reciprocal value, the specific electrical resistance r [Ù] as a third essential milieu parameter (Elmau, 1985). Like pH and rH2 these originally served to determine the quality of water, but it soon turned out that these three measuring units are equally suited to the evaluation of biological substrates. Vincent expanded the evaluation of the milieu to include the simultaneous measurement of the parameters in blood, saliva and urine. With the help of these three parameters it is possible to show four quadrants of the biological milieus for the blood (Figure3:) The small box between the quadrants indicates the area of health. Quadrant 1: acidic – reduced favours the healthy living of higher organisms; it is the terrain for e.g. green algæ, simple microbes and symbionts. Quadrant 2: acidic – oxidised - Has a disposition towards bacterial infections and to fungal infestation; is the terrain for e.g. lichens and fungi, therefore also for mycoses, tubercle- and leprosy bacteria as well as antibiotic forms of fungi. Quadrant 3: alkaline – oxidised – hypertonic, which is the area of the tubercular constitution. It is precisely the area of chronic disease in which pathogenic cell wall deficient bacterial forms (CWD) prefer to grow, according to Mattman. 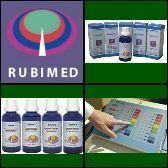 It is characterised by increased release of free radicals and, according to Vincent, disposes the patient to chronic viral diseases and degenerative processes. The dotted, downward-curving line which is curved downwards within this quadrant marks the area of malignant diseases; the diagonal line within this quadrant is the “line of thrombosis”. Quadrant 4: alkaline – reduced - Finally, this is the terrain for pathogenic germs such as pneumococci, typhus, cholera, the plague, as well as for kelp. Within quadrant number 1 a normal healthy life is possible. Approximately a hundred years ago the frequent occurrence of clinical tuberculosis was very characteristic; the condition of the blood at that time often corresponded to quadrant number 2. While living conditions changed during the last 50 years, a further move towards quadrant number 3 has taken place. Therefore nowadays the classical bacterial infectious diseases are rarely seen and, in their place, chronic viral diseases are on the increase, and so are degenerative and malignant processes. 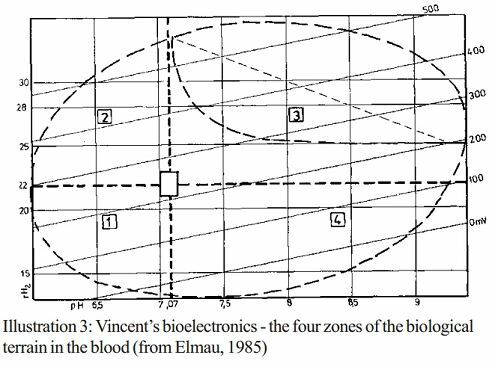 Mycoses, which are frequently seen these days, indicate a Illustration 3: Vincent’s bioelectronics - the four zones of the biological terrain in the blood (from Elmau, 1985) transition from quadrant number 2 to number 3. Looking at the changes of the blood milieu towards quadrant number 3, which is the quadrant of chronic illness from the bioenergetic point of view (table 2), it becomes clear that in contrast to the physiological conditions a marked increase of energy takes place in the blood. However, as cell metabolism is blocked, this energy cannot be put to use by the tissues. For that reason energy in the saliva is decreased and only a fraction of the energy is excreted with the urine, compared to the normal amount. Owing to these changes in the milieu of blood and tissues serious changes take place in the basic system according to Pischinger. Based on the energetic changes in the blood in chronic disease, it can be assumed, that sufficient energy is present to ensure the survival of cell wall deficient bacteria and cytoplasm. Like viruses they do not need their own energy metabolism due to their parasitic lifestyle within erythrocytes and leucocytes, but simply require the equivalent of their cell nucleus. Should the pathological changes in the blood and body tissues of the population continue as previously and unchecked, it is very likely that the blood milieu will move into quadrant number 4. In this quadrant life as we know it today will probably no longer be possible. Incidentally, the condition of our pets and domestic animals is not so different from that of humans. Comparable milieu changes in the interior and exterior of plants also play a part in the development of plant diseases (Hoffmann et al., 1994). This shows quite clearly that humans, animals and plants are all part of one common ecological system. The most important factor for milieu changes in humans is nutrition (Mielke, 1998); of especial significance is a high intake of animal protein.